These promotions contribute to my efforts to make the Windows world more aware of the benefits of AutoHotkey. You may also find the book free at other Web outlets. on Monday, May 1, 2017! Tell a friend! If You Use the Amazon Kindle, Get Your Copy of AutoHotkey Tricks Directly from Amazon—Free! 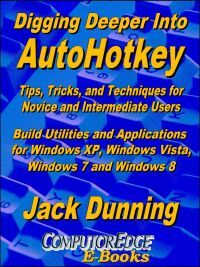 Already free everywhere else, you can now obtain a copy of AutoHotkey Tricks You Ought To Do With Windows directly from Amazon at no cost. The book offers a number of ways you should use AutoHotkey, but, more importantly, it includes the “Table of Contents” and “Book Index” from each of the other six paid AutoHotkey e-books. It acts as a handy reference for anyone looking for a specific scripting solution. One search of this e-book scans the indexes of all six books in one go. While AutoHotkey Tricks is always free, the next free giveaway of the Why AutoHotkey? book on Amazon is next Monday, May 1, 2017! Tell a friend! I’ve made the new e-book Why AutoHotkey? available exclusively on Amazon and you can get the book free. It’s not that you need the book since most of its contents can be found right here on the Why AutoHotkey? page. I’ve produced this book for people who don’t know about or use AutoHotkey. As you are already accessing this blog, you’re likely well aware of AutoHotkey. My goal with this new book is to reach the AutoHotkey unaware. I’m guessing the Amazon is loaded with those types of Windows users. I know…I’ve expressed my disdain for the way Amazon treats independent writers, but they have such a huge reach, it would be silly for me to completely ignore them. (I still prefer people buy from ComputorEdge E-Books, but everyone must have an option.) This new compilation book should help the uninitiated to understand how much power AutoHotkey can bring to their Windows PC.